The Solution: Employ these nine hypocrisy killing tactics to make sure you stay as far away as possible from undesirable moral dilemmas. Ever wondered if you’re a hypocrite who can’t be trusted? Of course you haven’t; no one does. Even the most morally bankrupt of us believe that the things we say and the things we do match up perfectly. Because hindsight is always 20/20, you allow yourself to reason away and justify your actions so that they align with who you think you are. This is how you keep yourself from going insane from inconsistency. The truth, though, is that we’re all hypocrites in one form or another. It’s almost impossible to get through life without coming across a situation where your beliefs and the things you say don’t match up with what you actually do. A man attacks a pregnant woman in the street for her purse. During the attack, he stabs her in the stomach, killing the unborn baby. How should the law treat this situation? Should the attacker be tried for the murder of the baby or just the assault of the woman? Now, how do you feel about abortion? Should it be legal or illegal? If you’re one of the many who answered that the baby was murdered and then also answered that abortion should be legal, congratulations: you might be a hypocrite. 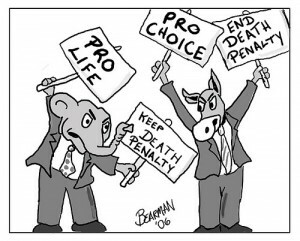 As always, the dividing line on this issue rests on this question: “When does a ball of cells become a human being?” If you agree that every human being has certain unalienable rights, then regardless what side of the line you fall on, shouldn’t your answers for the scenarios above be consistent? If an unborn child is not a human yet, then how can you be tried for killing one? If it is, how can abortion be legal. Yet, this is how the law works in the United States, so it’s an inconsistency held by many people. Like most things in life, this is hardly a black and white issue, and the scenario I proposed is oversimplified, but it goes to show that context does play a vital role in how differently you perceive similar situations. Which square below is the darkest? The answer is they’re all the same, but the square behind each determines how you see the square in front. This was just a “thought experiment.” You’re allowed to think whatever you want about abortion or what shade of gray is darker than another. True hypocrisy becomes a problem when what you say and what you do don’t match up. Now that you see how easy it is to think—and even act—differently depending on the situation, avoiding hypocrisy in your own life becomes paramount. Every day you’re presented with problems and challenges to overcome, and each decision you make about how to handle them plays a significant role in how the people you rely on to trust you see you. To be seen as a hypocrite is to lose respect and trust from the people you depend on. If you want to avoid hypocrisy in your own life, and maintain the trust you’ve worked so hard to build, then you’re in luck because much research tells us that there are at least nine different things you can do keep hypocrisy at bay as you navigate the often turbulent waters of life. 1. Ignore everyone and act only based on your own moral compass. You are highly influenced by your surroundings, and the way that you behave is affected almost immediately by the environment you’re in and the people you’re surrounded by. Just ask the 24 college students that participated in the Stanford Prison Experiment. Good, law-abiding citizens with high moral standards were quickly changed to entirely different people when they were isolated from the world they knew and placed into a fictitious prison environment where they became either guards or prisoners. The behavior that ensued was shocking and the experiment had to be ended a week early due to safety concerns. If you want to be sure that you’re actions always align with your principles, then you must ignore the environment that surrounds you. This, of course is impossible, so perhaps the best alternative is to avoid environments that would make you question your principles. The fastest way to draw criticism is by criticizing. It’s tempting to call others out, and it’ll probably get you much attention, but is it the attention you want? And is it worth the cost? You’ll more likely end up with notoriety than fame. The best way to fight hypocrisy in others is to fight it within yourself. Set a good example, and let your integrity be your condemnation. To lead a purposeful life, you must stand up for what is right, but you must also do it in a way that exemplifies yourself. Condemning others is also a dangerous hypocrisy trap when it turns out that you were wrong. 3. Identify context and how it changes the way you think. In 2010 U.S. Congressman Eric Cantor went on a popular radio show to praise and defend the Tea Party—a growing movement of people upset with government spending. He called their dissent patriotic and sympathized with their dissatisfaction. Then, next year when the Occupy Wall Street protests began gaining momentum—a group dissatisfied with the corporatization of government and showing it by demonstrating across the country just like the Tea Partiers—Cantor ridiculed the demonstrators. Congressman Kantor fell into the context trap, seeing two nearly identical incidents as completely different. Like you saw earlier, it’s a deceptively easy trap to fall into if you aren’t paying attention. And the best way to combat it is also very difficult—keep an open mind. It’s so tempting to support something that makes sense to you and condemn something else that’s unfamiliar, but this way of thinking is almost certain to land you in the context trap. Once you fall into it, the “hypocrite” label isn’t far away. 4. Listen to your cognitive dissonance. When you were answering those two questions at the beginning of this article, did you feel a slight discomfort? It could have been a mild stomach tightening, or a feeling of stress in your shoulders, or even a very light headache that’s hardly noticeable? If you had opposing answers, then you probably did. This is cognitive dissonance, and it’s something you experience every time you meet an inconsistency in your life. With years of practice, though, you’ve likely become very good at ignoring it. The human mind is very bad at accepting incomplete or inconsistent stories and when you’re faced with information that contradicts what you think you know, your subconscious goes right to work filling in the blanks or explaining it away to make you feel comfortable. The problem is that your conscious mind knows that what you’re doing is lying to yourself, and it fights for the truth. This battle inside your head is the discomfort of cognitive dissonance that you feel until your subconscious wins and you go back to the normal old you. To avoid hypocrisy, you have to acknowledge cognitive dissonance and teach your conscious mind to overcome your subconscious. You have to train the part of you that thinks rationally to start winning the fight against the part of you that thinks irrationally. This is incredibly difficult—your subconscious is the result of thousands of years of development to allow you to go through your day with minimal discomfort. Learning to listen to your cognitive dissonance takes practice, but the more that you focus on it, the closer to the truth you get. 5. Reserve judgment until you’ve actually experienced something. Is saying something and then doing something different the same as doing something and then saying something different? If you look at it mathematically (if a+b=c, then b+a=c) then of course it is. But the truth is, and it’s been proven by many studies, that we don’t see these things as the same at all. When someone says something and then does something different, we call them a hypocrite. But when someone does something first, and then says something different, we’re far more lenient. The reason is, sometimes, words speak louder than actions. If someone tells us that abortion is immoral, then we take them for their word. If then they go and have one, we see a serious inconsistency that can’t be reconciled and we no longer trust them. But if that person were to have an abortion, and then speak out saying that it’s immoral, we see this differently. Since we don’t have any earlier beliefs to judge them on, we’re more likely to see their inconsistent message as a sign that they tried something and then learned a lesson from it. We’re more likely to lend them the benefit of the doubt that they actually changed and, therefore, are still worthy of trust. If you want to minimize hypocrisy in your life, it’s best to act first, and speak later. The idea of practicing integrity seems preposterous at first—how can you “practice” being a moral person? You either are or aren’t one, right? But on further inspection, isn’t it true that basically everything we are is a result of practice and the habits that we either do or don’t create for ourselves? If you can become a great basketball player by running drills all day and playing pick up games at the gym, doesn’t the same apply to integrity? Why can’t you also become someone with integrity by thinking more about the principles that are important to you, and then finding ways to practice upholding them? In time, won’t you start to recognize the types of situations that you should avoid and have plenty of experience in avoiding them? Making promises is probably the biggest hypocrisy trap. It’s certainly the favorite downfall of politicians eager to encourage people to trust them. The truth about a promise is that no human being actually has the power to make one. Unless you secretly control the universe, a promise is nothing but a gamble that you’re placing on yourself and betting to win. Making a promise to anyone is basically telling a lie and then trying to find a way to make it come true. If you have integrity you don’t need to make promises because the trust that comes with the consistency that people see in you is enough. If you do control the universe, though, please send me an email. There are a few things I’d like to change. 8. Avoid positions of power. Would you believe it if I told you that the more authority you have, the more likely you are to be a hypocrite? Actually, you probably would since the most memorable hypocrites you know are or were in positions of power. And it’s true. In a study at Northwestern University, researchers learned that the more power a person was given over others, the more likely they were to abuse it and see no problem with their actions. What they found was that if you see yourself as a legitimate holder of power, you tend to judge others more harshly than you judge yourself because you see yourself as deserving of the power that you have and others don’t. You become “better” than your subordinates. Another interesting result of the study was that illegitimate power doesn’t create the same effect. If you don’t have power or you believe that the power you hold is illegitimate, you tend to judge yourself more harshly than you judge others. Absolute power corrupts absolutely, and if you want to avoid hypocrisy, then you’d be advised to avoid it. If you do attain some power, though, you’ll be better off remaining humble about it. As a rule of history, leaders that lose their humility tend to meet their demise under less than desirable circumstances. 9. Don’t trust your friends. If you can’t trust your friends, then who can you trust? No one I suppose. The problem with hypocrisy spreads beyond the person and applies to groups, too. At least that’s what researchers at Northeastern University found when they tested people to learn how they compared identical actions by different people when one of those people were part of a group they belonged to. Unsurprisingly, you’re far more likely to accept hypocrisy from your friends than you are from a stranger or someone that doesn’t share a common interest with you. This is part of our group mentality—probably a coping mechanism we’ve learned through generations to get along with the people we’re close to. But is it right? I don’t think so. Absolute and unquestionable trust in another is immoral. To give away your ability to reason and think rationally isn’t in your own or anyone’s best interest. Hypocrisy is a difficult subject. It’s awfully hard to get through life without experiencing it in some way, shape or form. Just by the nature of life, we learn and grow as we have new experiences. And you do a disservice to the world if you allow the way that you think now to rule your life forever, never taking the chance to try something new. There are no universal truths, everything changes, and your values should be subject to constant scrutiny. Welcome to a life of risk.